Breitling Colt men's black leather strap watch featuring visible white stitching, round dial with luminescent hour hands, glare proof sapphire crystal cover and water resistance up to 200m. 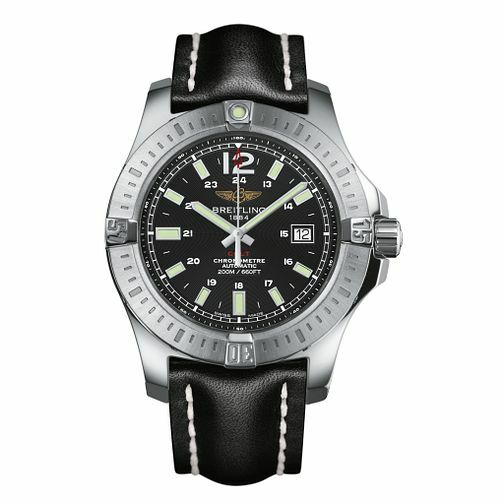 Breitling Colt men's black leather strap watch is rated 3.7 out of 5 by 3. Rated 5 out of 5 by Anonymous from Breitling Colt black leather strap A beautiful watch sold at a highly competive price, very pleased with purchase and would recommend supplier. Rated 5 out of 5 by Anonymous from I love this watch I changed the leather strap for a stainless steel bracelet and i am very happy with this watch not just for the look that with the stainless steel bracelet is better but also is now more resistant and I can make use of the fact that is a water prove watch which i can dive with.